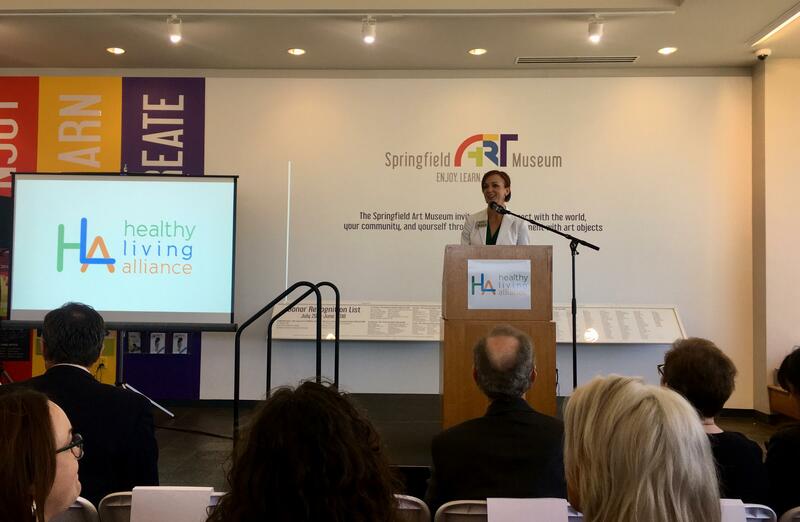 Katie Towns, assistant director of the Springfield-Greene County Health Department, welcomes community members to the official release of the report Friday at the Springfield Art Museum. The Springfield-Greene County Public Health Department and several partners released a long-awaited report Friday assessing the community’s mental health. Anxiety disorders and Depression accounted for more than half of all diagnoses of people seeking outpatient mental health services in our community in 2017, according to the report. In 2017, local health care providers reported 35.4 percent of their outpatient diagnoses were anxiety, or stress-related disorders. 29.1 percent of outpatient diagnoses were Major Depressive Disorder, also known as Depression. As for people admitted to hospitals in Greene County, approximately two out of five patients included a primary diagnosis of Depression. Greene County’s rates for depression are higher than the national average, and so is Springfield’s suicide rate. According to the data, the 2016 rate for completed suicides in Springfield was about 23 per every 100,000 people. And nationwide, men are at a higher risk for death by suicide than women, and non-Hispanic, white people have a significantly higher suicide rate than non-white minorities. At the official release of the mental health assessment, health department director Clay Goddard spoke pointedly to the men in the audience and the community about getting help. “Men in Greene County are 221 percent more likely to die by suicide than women. And I suspect that a lot of that is that we try to be strong and that we don't talk. We don't talk to our spouses or to our families. If we're uncomfortable with that, we don't talk to our buddies, to our clergy, or our counselors. Men, we've got to realize that it's okay to be strong and vulnerable," Goddard said. The data was collected by Maine-based consulting firm, Crescendo Consulting Group. The data was collected in more than 60 in-depth interviews and looking at over a dozen focus groups. The big question after a major report like this is: what happens now? Health officials say they hope to teach the community about depression, anxiety and other mental health conditions so that people are encouraged to get the help they need. And then there’s the access piece—making sure that help is readily available. A huge piece of the puzzle in making sure people have access to mental health care is funding. Unlike many other states, Missouri’s Republican-led legislature has rejected for years the option of expanding Medicaid coverage for lower-income Missourians, even though the federal government was poised to pick up most of the cost. Read one of KSMU's stories on how Medicaid expansion could have affected an Ozarks family by clicking here. The top two priorities identified in the community health assessment are: increasing the number of mental health professionals and increasing access to inpatient mental health and substance abuse treatment beds. You can listen to KSMU’s series on the severe shortage of mental health professionals in Missouri, "Waiting For Care," by clicking here. And KSMU’s ongoing series “Making A Difference” is currently devoted to encouraging listeners to talk about their mental health with those around them. You can find that series here.